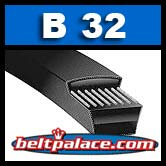 B32 POWER ACE V-BELTS: B Section. 35" L OC x 21/32" W.
Home > Comet Clutches and Parts > Comet 200181A. Self Contained Single Pulley. > Comet 202313A. Comet Industries 350 Series Drive Clutch. 7/8" Bore. > Comet 202312A Centrifugal Clutch. Heavy Duty Self Contained Single Pulley. > Comet 200182A Centrifugal Clutch. A or B Pulley. 3/4" Bore. > B32 POWER ACE V-BELTS: B Section. 35" x 21/32"